I’ve been loving my new little Sony gizmo lately! Let me tell you – if you want a fun time in portable form, and you don’t want to go onboard with the Switch yet, or pull the trigger on a much more expensive Playstation Vita, do yourself a favor and pick up a PSP. A PSP with custom firmware has been some of the most fun I’ve had in ages! Heck, for $100 you can get a great condition system, a 32 gigabyte MicroSD card with MemoryStick adapter, and maybe even one or two games. You can then use the custom firmware to rip all of your games from their respective game discs right on to your SD card, never having to use them again. I’ll save more PSP knowledge for another post, however! My sudden acquisition of several PSP games meant I had to make a decision of which one to play first, bridging the gap between Hey! Pikmin and Metroid: Return of Samus, and for whatever reason, the one that most appealed to me was the game Daxter. As the sequel to the original Jak & Daxter: The Precursor Legacy on Playstation 2, Daxter tells the story about how Daxter busted Jak out of prison, acting as a spin-off title that bridged the gap between the first two games. As I’m currently in the Prison level of Daxter, the final level in the game, I felt I had played more than enough for a short Thoughts On write-up on my first PSP game! My most formative years were spent with the 3D platformer, and if I were to compile a highlight reel of said platformers, Jak & Daxter would surely have a spot of prominence. Following my tremendous disappointment with The Jak & Daxter Trilogy on the Vita, due to horrendous performance that robbed the gameplay of any fun whatsoever, I was a bit hesitant to jump into a sequel on Sony’s even less powerful handheld device. However, a new sealed copy ran for $6 with free shipping on eBay, and I knew I had to give it a shot. I couldn’t be happier to say, that for the first time in ages, I found a 3D platformer that was straight up fun from start to finish. Daxter is quirky, hilarious, and plays like a dream. It’s considered by some to be the best 3D platforming experience that the PSP has to offer – and of course this is both a blessing and a curse to me, because it’s going to be a tough act to follow. It’s truly right at home on Sony’s first handheld. But what makes a 3D platformer so great? 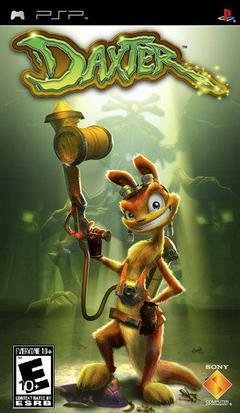 Why, right now, 11 years after release am I enamored with Daxter, a spinoff game from a franchise from the early 2000s? Simply put, the accessibility and relaxing play style. You assume control of Daxter, everyone’s favorite snarky half-weasel/half-otter as a hired exterminator working for an old man named Osmo in the world of Haven City, two years after the events of Jak & Daxter: The Precursor Legacy. You are sent on various pest extermination quests throughout the city, murdering bugs and collecting.. collectables. At a certain point in the game, Daxter sees Jak cruising by in a ship, which sets off the plot twist and changes Daxter’s goal to that of rescuing his old friend from prison. Daxter and his trusty fly swatter, looking pretty good for 2006! The gameplay loop is straightforward as ever: you are sent on missions, you show up to the area as shown on your mini-map, and you enter a level and complete your mission. Daxter itself is very linear, as you are never involved with more than one quest at a given time. You simply go from one location to the other, and while you are free to meander around and find Precursor Orbs in the overworld, I was unable to find any side quests in the game. Given that this is a handheld game, I think this works perfectly, as you generally need 15 minutes to a half an hour to complete any quest from start to finish, but of course you can save anywhere, or simply send the PSP in sleep mode. The auto-save feature is also a nice addition to Daxter. As with any 3D platformer, there are plenty of times where you will need to navigate throughout a level perfectly. Fail, and you can retry an infinite amount of times, as there is no Lives system. Nine times out of ten, it puts you right back to the beginning so you can make another attempt without having to repeat much of the level. In other words, the auto-save sections are very frequent. Daxter has the ability to scale walls, like all ottsels. I assume. Outside of the regular quests, there is a series of mini-games that you can unlock by collecting Precursor Orbs, where you hop into a bed, and then control Daxter inside various dream sequences based on films like The Lord of the Rings and The Matrix. All of the mini-games that I played through were about precision button pressing, and were very fun! I’m already a huge sucker for those things, so they were right up my alley. You can earn high scores and unlock more levels depending on how long you can survive. Overall, I didn’t spend much time in these mini-games after my initial playthrough that I accidentally deleted, but following the completion of the main quest line, I may go back and see what else they have to offer, because I found them quite enjoyable, and a nice change of pace from the main quest line. Some 3D platformers find it tough to strike a balance when it comes to gameplay diversity and difficulty, but Daxter manages to hit a sweet spot where it never reaches the frustrating stage. One thing is certain, however – you need to take your time in a lot of sections in this game. I have a tendency to fail near the very end of a challenging level segment like, say, jumping across lily-pads in a river, and I then want to rush back to where I left off. But patience is a necessity in Daxter. Taking your time and exploring as much as you can is rarely left unrewarded, anyway. But trying to rush each part will quickly mean falling into a pit of Dark Eco for little Daxter. Daxter using his Flamethrower to take out an enemy hive. Upon starting the game and going on your initial extermination quests as part of your gainful employment, you only have the ability to attack with your electric fly swatter. While severely underpowered, you eventually build up combos that can be fairly devastating if you time them correctly. Battling several enemies at a time can be frustrating an exercise at first, but over time you figure out how to take them out most efficiently. When you earn the extermination canon, it’s even more challenging and fun, as the enemies get stronger but you earn the ability to stun them from a distance. The boss battles are also very challenging and can require several attempts before you learn the boss attack patterns. The “invincibility frames” are extremely short in Daxter, meaning you can get hurt very quickly after just having taken a hit, so a fast recovery is paramount to making it through alive. The controls feel great and inspire platforming confidence, and as this was the first 3D PSP game that I played, the little joystick nub did a pretty good job of letting me feel totally in control of Daxter himself. I was quite hesitant upon first feeling the joystick, what with my many long hours of gaming with the Vita’s vastly superior joysticks, but working in conjunction with the Left and Right Triggers, the camera angles were always at least satisfactory. Double-jumping across chasms and floating around with my arsenal of extermination tank fuel is very satisfying and felt great – although there were some occurrences where I could not determine the depth at which Daxter was floating. This is more an issue of the PSP’s limited graphical prowess (like a distinct lack of detailed shadows that would help in this scenario) and not so much the fault of the game, however. In any case, the fact that the game lets you retry just about any section as many times as necessary nearly negates this issue. I mentioned Daxter floating: early on in the game you acquire an extermination tank for assistance in killing and stunning enemies, and you eventually obtain two more fuel types. These fuel types are switched using the D-pad Left and Right buttons, and give you varying levels of boost that let you float for a short distance after jumping. It adds a new element of challenge to the game, having to chain together boosts to cross large platforming sections, thus proving Daxter as a highly capable 3D platformer, even on the small screen. The graphics look gorgeous, and I still can’t believe this came out on a handheld 11 years ago! Speaking of controlling Daxter, there are several parts in the game that require you to get off your feet and take control of various machines. At a certain point, you get a hover-craft-motorcycle type of device for personal use, allowing you to zip around Haven City much more time-efficiently, shaving long travel times off the clock. On top of this, there are several zip line sections throughout the game where you need to maneuver Daxter around various obstacles as he slides through levels, jumping laterally from zip line to zip line, collecting Precursor Orbs and avoiding walls. There are also several vehicle sequences where Daxter acts as pilot or co-pilot to fend off enemies with a canon or run over bad guys. All of these different gameplay modes crammed into a relatively short game makes Daxter an absolute “must-buy” for anyone looking to add to their PSP collection. I don’t know exactly how long this game took me to beat, but I’d estimate it’ll be about 10 hours over a dozen or so bus rides that I’ve been enjoying my time wandering about in Haven City. If you’re a fan of the 3D platformer, and especially a fan of the original Jak & Daxter, I highly recommend adding Daxter to your collection! It’s good clean fun for the whole family, just as good as Naughty Dog’s earlier titles. For the price to fun ratio, better deals can rarely be had. Have you played Daxter? Are you a fan of the franchise? Let me know in the comments, let’s talk about things! Previous Post Previous post:Question of the Month: September 2017! When Sanzaru was porting over the PSP ratchet and clank games to the PS2, I always wished they would have ported Daxter as well. This definitely stands on its own, and I always did prefer Daxter’s personality over Jak’s (he did, after all, do most of the talking). Fingers crossed it will get a remaster on the PS4…I’d be more than happy to double dip. I loved the Jak & Daxter trilogy, easily up there with my favourite games of all time. I missed the PSP entirely, but this game still caught my attention because, you know, it’s Daxter. Great review! Thanks for the compliment 🙂 Jak was such a well done platformer for the time that stands the test of time quite well – I’m happy to say Daxter is great as well! I’ve been loving my PSP, although this week 3 huge releases are getting delivered to my house (Metroid and two Ys games on Vita), so I’ll be taking a break. I completely forgot about this game! I played it years ago, but it wasn’t mine it was a friend’s so I didn’t get to finish it. I remember really enjoying it though! You’re living up to your Nostalgia Trigger name! Jak and Daxter is my favorite series and Daxter was the reason I got a PSP back when it came out! I love this game. It was cool to see the ottsel get his own adventure. I liked using the bug spray as a hovering device sort of like Mario Sunshine. The level designs here are pretty sharp too. I think one thing that I really like about this game compared to some of the other Sony games on the PSP is that they built the control scheme around what the PSP had available. They kept the essence of Jak and Daxter gameplay here, but instead of trying to cram a more button-heavy scheme from a PS2 series (like MGS, Ratchet and even the later Jak PSP game did), they made something a bit more comfortable for the PSP’s button layout. The graphics in this game were really impressive for a handheld when it first released too. Anyway, I love this game and I’m glad to see you are enjoying it so much! I really need to replay this, one of my favourite PSP games and one of the first things I played on my Vita once I got it! Really a perfect adaptation of the franchise from another developer & for handheld format.